Practice Solid State Chemistry questions and answers for interviews, campus placements, online tests, aptitude tests, quizzes and competitive exams. This set of Solid State Chemistry Questions and Answers for Freshers focuses on “Modification of Existing Structures by Ion Exchange and Intercalation Reactions”. 1. In which of the following process, extra atoms or ions are inserted into the crystal structure? Explanation: Intercalation is a process in which extra atoms or ions are inserted into the crystal structure in order to modify the structure and composition of an existing crystal so as to yield new compounds. 2. In order for a crystal to undergo intercalation or ion exchange method, which is the most important characteristics that it must possess for this? Explanation: In order for a crystal to undergo any of the modification processes like intercalation or ion exchange method, it must possess certain structural characteristics, the most important is the degree of structural openness which permits foreign atoms or ions to readily diffuse into or out of the crystal. 3. In the case of graphite and TiS2 intercalation compounds, what is the structure possessed by the host crystals? Explanation: During the intercalation process of graphite and TiS2 compounds, the host crystals possess layer or lamellar structure and the layers are pushed apart as foreign atoms or ions penetrate the interlayer space. 4. Which of the following can act as a host crystal during the process of intercalation? Explanation: Graphite ac as a host crystal that is capable of intercalating a wide variety of atoms, ions and molecules. And as such it has been extensively studied. It forms intercalating compounds like graphite fluoride, bronze etc, where it acts as a host crystal. 5. What is the structure of Graphite? Explanation: Graphite has a planar ring structure and it has oblique projection showing the two-layer stacking sequence, it is possible to intercalate, for example, alkali cations, halide anions, ammonia and amines, oxysalts and metal halides between the carbon layers. 6. What is the structure of graphite potassium, C8K? Explanation: In the graphite potassium, C8K, the graphite layers are superimposed in projection but the potassium atoms are not and various stacking sequences are possible.C8K forms on exposure of graphite to molten potassium and the potassium may be subsequently removed under vacuum. 7. What is the coordination number of carbon in the graphite structure? Explanation: Coordination number is also known as ligancy, it is the number of atoms, ions, or molecules that a central atom or in holds as its nearest neighbours in a complex or coordination compound or in a crystal. Hence the coordination number of carbon is 3 because of which the individual carbon, layers are not closely packed layers. 8. In which of the following manner the carbon layers are arranged in the graphite structure? Explanation: In graphite structure, the carbon layers are stacked together with a two-layer repeat unit which may be represented as ABABAB. Thus some carbon atoms are directly over the carbon atoms in the layer below whereas others are over the space in the middle of the rings. 9. What is the hybridization of carbon atoms in the graphite structure? Explanation: The carbon atoms in the graphite structure can be considered as sp2 hybridized, with an additional p orbital, containing a single electron, perpendicular to the plane of the rings. 10. Which of the following statements is true for the thermal and electrical conductivity of graphite structure? Explanation: The carbon atoms of graphite structure are sp2 hybridized, with an additional p orbital, containing a single electron, perpendicular to the plane of the rings. These p orbitals overlap with the similar p orbitals on adjacent carbon atoms resulting in an infinite, two dimensional, delocalized ∏ electrons due to which according to the band theory terminology, it forms conduction band of graphite which results as a high thermal and electrical conductivity. 11. In which of the following patterns, the carbon layers are arranged in the graphite potassium structure, C8K? Explanation: In the graphite potassium C8K structure, the carbon layers are different to those in the pure graphite structure and they are arranged in the form of AAAA pattern where the potassium ions are sandwiched between pairs of carbon rings. 12. What is the coordination number of the carbon atoms in the graphite potassium structure, C8K? Explanation: Coordination number is also known as ligancy. It is defined as the number of atoms, ions, or molecules that has a central atom or ion holds as its nearest neighbours in a complex or coordination compound or in a crystal. In potassium graphite structure, the carbon layers are arranged in AAAA pattern where the potassium ions are sandwiched between the pairs of carbon rings, thus resulting as a coordination number 12 of carbon atoms. 13. In C8K, how does the graphite behave? Explanation: The electronic structure of the graphite is modified on intercalation of potassium atoms since partial electron transfer from potassium to graphite occurs, resulting in a polar structure which may nominally be represented as C8–K+ hence it acts as an electron acceptor. In other compounds like graphite halogen compounds, it acts as an electron donor. 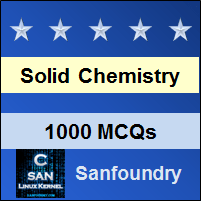 To practice all areas of Solid State Chemistry for Freshers, here is complete set of 1000+ Multiple Choice Questions and Answers.